Doodle!! Doodling is a great way to loosen up your wrist, fingers, and your mind.It can relieve tension and get you ready for a fruitful artmaking session.Try out this easy lesson for drawing doodle monsters! Pay special attention to color to create mood. Bright colors are generally happy and uplifting. Darker colors are generally more somber or moody. Bold colors are jubilant and forceful.Soft colors are more calm and peaceful. You can add eyes or a face to anything to make it "anthropomorphic", or human-like. This is almost always endearing, as it gives human qualities and emotions to inanimate objects. It causes us to see those objects in a new way, and allows us to relate to them. Big eyes are often used to create a great "cute" effect, whether its big-eyed girls or big-eyed bunnies. Illustrate a scene from your favorite fairy tale. If illustrating a whole scene is too daunting at first, start by illustrating one of the characters. Use the written description as a starting point, and add your own changes or embellishments to make the character more your own. Pick one of the following words and create a character that illustrates that word: wacky, kooky, silly, spooky, goofy, cutesy. If you want more words to chew on, use a thesaurus, where you will find a slew of new and usable words! 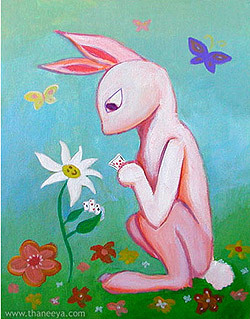 Do a flickr search for "whimsical art", "whimsical painting", "whimsical drawing", etc. Let your imagination go wild. There's nothing holding you back - you can draw or paint whatever you can dream up! Have fun! Whimsical art is all about fun. Return to the Table of Contents to learn more about whimsical artwork.